If you've ever marveled at the amazing community effort of the Amish barn raising parties, where young and old, male and female, strong and weak all come together with a common purpose, Catalonia's Castle Makers (Castellers) will also attract your attention. Of course, instead of raising wooden barns, they raise human towers--sometimes 9 levels high. Brightly colored clothes (unique to each club or colla), bare feet, and wide cummerbunds distinguish climbers from the public that surrounds them on castle-building day. There are huge, stout, strong men that will create a strong foundation, the strong but light-weight athlete types, who will hold up the middle, a very few women in the upper levels, and a couple of young kids for the very top, sometimes as young as five years old. Everyone has a place. As a tower begins to form, supporters surround the foundation, placing hands one on top of the next to make a solid base (the pinya or pineapple, so called because the rows of hands spiraling out from the center resemble that fruit). Meanwhile, the climbers get in line, waiting for instructions from the choreographer. Speed is a key factor in safely raising and dismantling a castle. As the third level is put in place, a group of musicians plays a special song that signals that the tower is going up. There's no turning back now. Watching this diverse group of people join together fills me with envy and anxiety. Anxiety because sometimes they fall, five year olds and all. Envy because usually they don't, thanks to the outstretched hand of the next person over. The Castellers de Vilafranca is an exceptional group which has successfully executed some of the most difficult tower constructions. 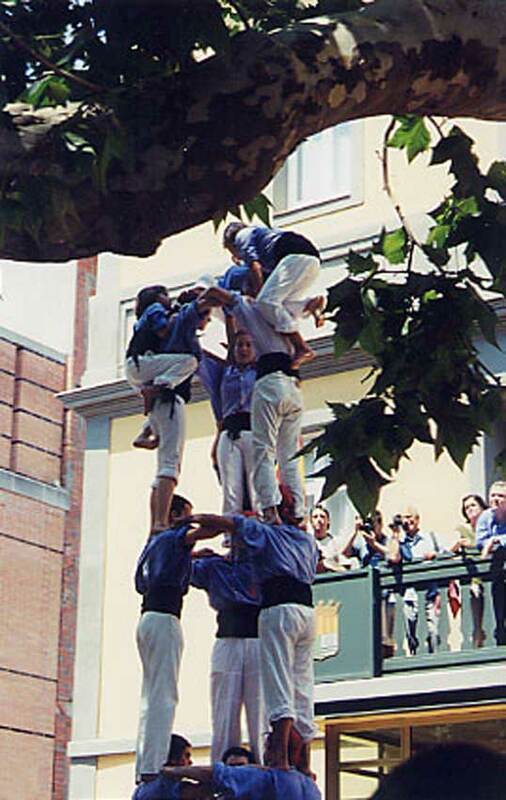 The Minyons de Terrassa is one of the oldest colles and hold the number 1 ranking, from Avui newspaper. And there are two clubs in Valls (home to the famous Calçotada festival): La Colla Vella dels Xiquets de Valls and Colla Joves Xiquets de Valls. The pictures on this page are of the Marrecs de Salt.